This photograph may be one of my favorite wedding details images of all time. The bride had chosen a beach theme for her waterfront wedding on Long Island, New York and a starfish was a recurring item. It was printed on her wedding invitations and the dinner reception menus that adorned the guest tables in the ballroom. They were sprinkled liberally on the guests tables in the dining room as well as on the guestbook sign in table in the main lobby of their reception venue…Timber Point Country Club in Great River, NY. I grabbed one of the many starfish that adorned the premises and positioned it on a table surrounded by the bride’s and maid of honor’s floral bouquets. 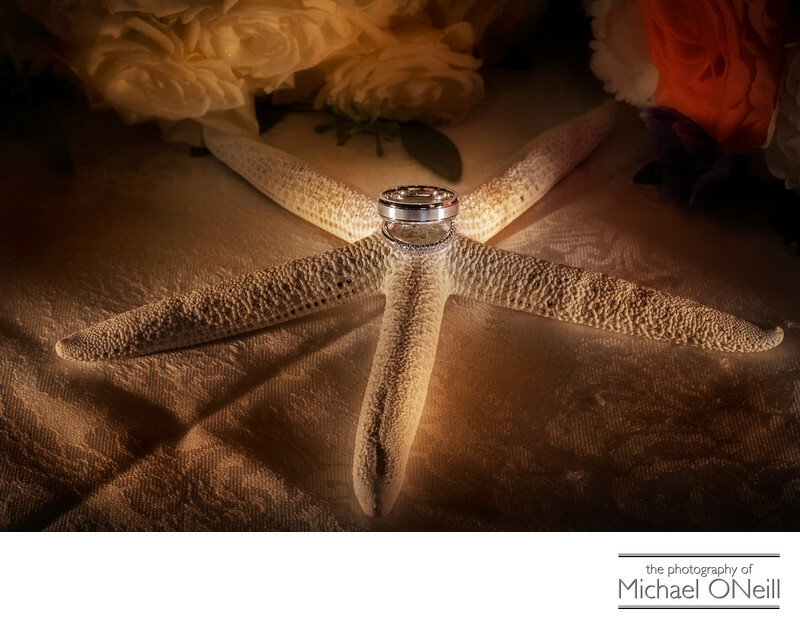 I the positioned the wedding rings atop the starfish and set about lighting the set dramatically with two compact tungsten video lights. Like any great wedding details shot this one shows a depth of detail from the texture of the starfish, to the milled grooves on the groom’s wedding band to the sparkling diamonds set in the bride’s wedding ring. Great detail shots are only executed by experienced wedding photographers who understand the principles of macro close up photography and lighting. When shopping for a photographer that meets your style for the big day be sure to check out their pictures of details as well as the people that will make up your big day.